Did somebody say smooth, rich, velvety lasagna? 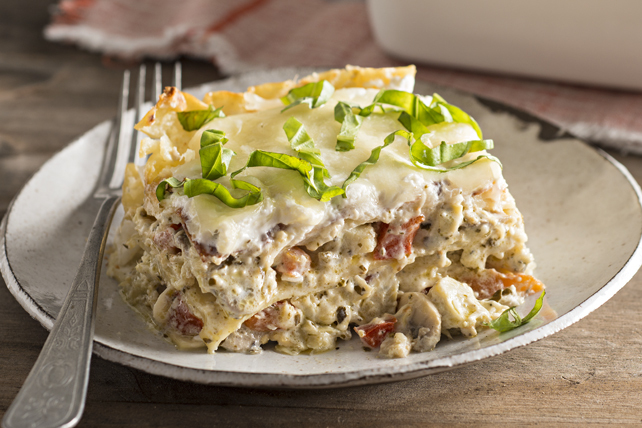 Mushrooms, peppers, pesto and fresh basil add tons of flavour to this Creamy Artichoke Lasagna. Cook and stir mushrooms and peppers in large skillet sprayed with cooking spray on medium heat 5 min. or until tender. Remove from heat. Add artichokes, pesto, Parmesan and 1 cup shredded cheese; mix well. Beat cream cheese spread and garlic powder with mixer until creamy. Gradually add milk, beating well after each addition. Reserve 2 cups cream cheese mixture. Add remaining cream cheese mixture to vegetable mixture in skillet; mix well. Spread half the reserved cream cheese mixture onto bottom of 13x9-inch baking dish sprayed with cooking spray; cover with 3 noodles and 1/3 of the vegetable mixture. Repeat layers of noodles and vegetable mixture twice. Top with remaining noodles, remaining reserved cream cheese mixture and shredded cheese; cover. Bake 25 min. or until heated through. Let stand 5 min. before serving. Cut basil into thin strips; sprinkle over lasagna. This creamy vegetable lasagna can be balanced out with a hot steamed fresh vegetable, or a crisp mixed green salad tossed with chopped fresh vegetables and your favourite Kraft Dressing. For a touch of heat, substitute Cracker Barrel Shredded Habanero Heat Cheese for the Cracker Barrel Shredded 4 Cheese Light Italiano Cheese. Lasagna can be assembled ahead of time. Refrigerate up to 24 hours. When ready to serve, bake (covered) in 350ºF oven 50 min. or until heated through, uncovering for the last 10 min. Stack basil leaves; roll up tightly. Cut crosswise into thin strips.